- Publisher Good news for the needy. Bad news for the power brokers. Jesus came into the world announcing a new order where Satan is overthrown and broken relationships are restored. 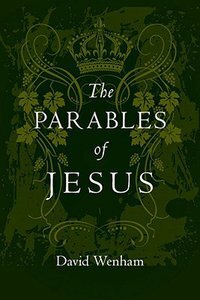 Jesus' most vivid portraits of this new kingdom are found in the parables.David Wenham explores the splendor and subtleties of Jesus' world-changing message, offering a nontechnical but comprehensive look at dozens of Jesus' stories. Bringing them to life by explaining their first-century religious and social setting, Wenham never fails to illumine their significance for today. About "The Parables of Jesus"
Good news for the needy. Bad news for the power brokers. Jesus came into the world announcing a new order where Satan is overthrown and broken relationships are restored. Jesus' most vivid portraits of this new kingdom are found in the parables.David Wenham explores the splendor and subtleties of Jesus' world-changing message, offering a nontechnical but comprehensive look at dozens of Jesus' stories. Bringing them to life by explaining their first-century religious and social setting, Wenham never fails to illumine their significance for today. David Wenham (PhD., Manchester University) is Vice-Principal of Trinity College, Bristol. He previously taught in India at Union Biblical Seminary, returning in 1979 to Tyndale House in Cambridge where he directed the Gospels Research Project, then as Dean and Vice- Principal of the Wycliffe Hall, Oxford. His selected publications include Gospel Perspectives. (Continuum International Publishing Group, 1984), The Parables of Jesus. (Downers Grove, IL: IVP, 1989), Paul: Follower of Jesus or Founder of Christianity? (Cambridge: Eerdmans, 1995. )Exploring the New Testament (2 Volumes) D. Wenham and S. Walton. London: SPCK: 2001.) Paul and Jesus: The True Story. (London: SPCK, 2002). 3. The Revolution Is Here!